Behind Diplomatic Lines: Relations with Ministers opens on a diplomatic crisis. A growing number of countries are threatening to boycott the Commonwealth Games in protest of the British government’s handling of South African apartheid. And the problems only get worse. Patrick Wright was one of the pre-eminent diplomats of his day, putting him at the forefront of some of the late twentieth century’s most important global events. His five years at the FCO found him dealing with the backlash from the Falklands War, the collapse of the Soviet Union, strained relations with the EU, the First Gulf War and, perhaps most challenging of all, the ‘fire and glares’ of Prime Minister Margaret Thatcher. Lord Wright’s account is not only an essential documentation of a significant historical period, but witty and entertaining throughout. He revels in gossip, despairs at the mischievous press ‘painting lurid pictures of Britain versus the Rest’, recalls numerous amusing scenarios and is rather brutal in his assessment of various high- profile political figures. 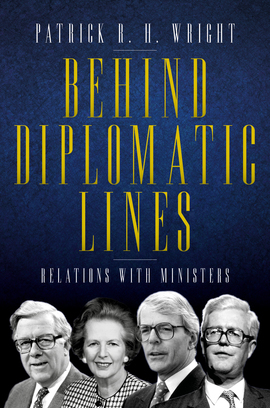 A captivating account of the inner dynamics of the Thatcher Cabinet, all played out in front of a tumultuous global backdrop. These diaries give us an intimate and fascinating insight into the often stormy latter years of Margaret Thatcher’s premiership and the first year of John Major’s. They cover the author’s five years as Britain’s most senior diplomat at a time of profound change in global politics. The diaries take us deep into the inner sanctums of power, revealing truths that force us to reappraise our understanding of these halcyon years. This is a riveting and highly readable account of some tumultuous years in Whitehall and Westminster. The theme is Patrick Wright’s unshakeable conviction that the Diplomatic Service – if used properly – can make a real impact in protecting and promoting British interests around the world. For historians and Whitehall-watchers there is no juice like insider juice. These diaries brim with it and carry us to the heart of the Diplomatic Service. Patrick Wright has a connoisseur’s eye for character, episode and detail. A diary to be revelled in. Fascinating diaries informed by self-deprecating humour, a keen eye and deft touch. […] A treasure trove of anecdotes, Wright’s diaries will entertain and challenge.